(Wales Online )So far as the rest of the world is concerned, Somaliland existed as an independent state for just five days, back in 1960. But so far as those who live there are concerned, its recent history has seen it functioning as a stable, independent democracy since 1991. This may appear confusing, but in fact it reflects a constitutional disparity between the world of diplomacy and the world as it actually is. 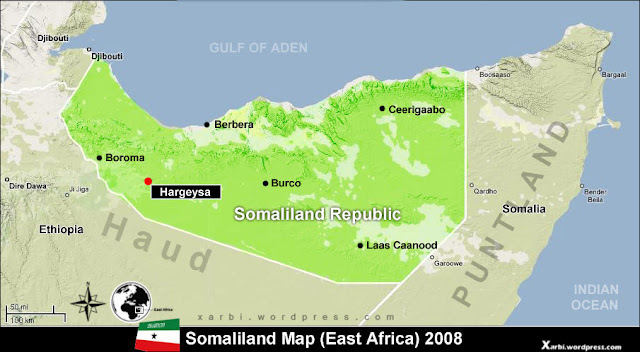 Until June 1960, Somaliland was a British colony with a population roughly the same as Wales. There was a strong link between the two countries dating back to the 19th century, when Cardiff was one of the world’s biggest coal-exporting ports and Somali sailors joined the crews of British ships. At a time when British colonies were winning their independence, the people of Somaliland voted to join a federation with the country’s larger neighbour Somalia, which was gaining its independence from Italy. The federation came into being five days after Somalia won its freedom. But Somaliland lived to regret joining the country to its south, especially during the dictatorship of Siad Barre. When he was deposed after an uprising in 1991 Somaliland re-established itself as a separate country. And while Somalia has become a failed state and a haven for Islamic fundamentalists and pirates, Somaliland is a beacon of stability in a continent with more than its fair share of dysfunctional regimes. Its current head of state is the fifth successive president to have been elected since 1992. On each occasion there has been a peaceful transition. Yet Somalia has international recognition, while Somaliland officially doesn’t exist. Eid Ali Ahmed came to Cardiff as a refugee during the Barre years. A banker by profession and a former deputy chief executive of the Welsh Refugee Council, he is now an adviser to the Somaliland government. He’s in the forefront of the campaign to get his homeland recognised as the functioning democracy it is. Academics from Cardiff University produced a report called The Role of Informal Economy in Post-Conflict Cities. The country has a sizeable fishing industry, and exports fish and other goods to Ethiopia and the United Arab Emirates. But what rankles is the lack of formal recognition – and travel advice from the Foreign & Commonwealth Office (FCO) which lumps Somaliland in with Somalia as being too dangerous to visit. dditional guidance from the FCO said: “This has been the UK’s long-standing position on Somaliland. We continue to support and encourage plans for dialogue between Presidents Farmaajo [of Somalia] and Muse Bihi [of Somaliland]. "As the UK Minister for Africa made clear in Hargeisa last October, the UK enjoys a warm and historic relationship with Somaliland and is working to support the shared security and prosperity of people across the Somali region, including in Somaliland.